Video of flights over top monuments of Dubai in HD format. It’s hard to imagine Dubai, and United Arab Emirates in general, without its famous architectural landmarks. 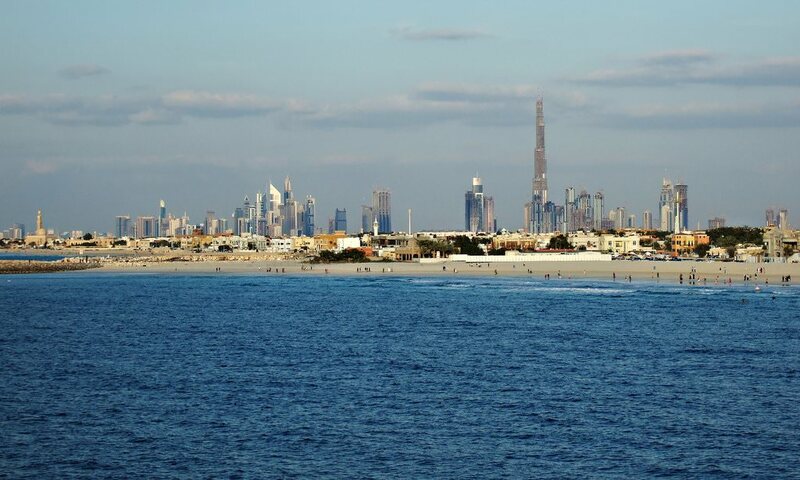 Jumeirah Beach Hotel, Dubai Mall, Emirates Towers, Atlantis The Palm, Emirates Park Towers, and Dubai Silicon Oasis have shaped the historical and architectural look of Dubai. Let’s take a closer look at these landmarks from an unusual perspective – simply fly over the main sights! The supporting video includes a virtual tour around the above mentioned architectural landmarks of Dubai in HD format. Below, we will add the most exciting historical facts regarding every place of interest. The overview map of all iconic landmarks of Dubai can be found at the bottom of the webpage. 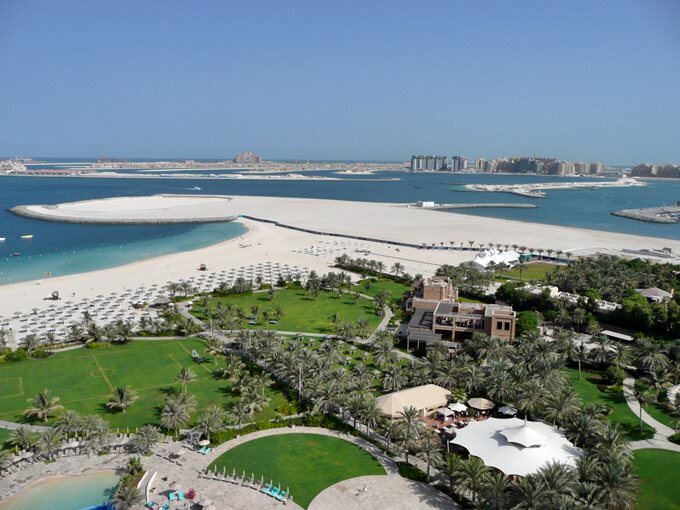 » Jumeirah Beach Hotel is one of the largest and most famous hotels in Dubai. » This five-star hotel was built in 1997 in form of a sea wave. » The height of this 26-storey hotel is 104 meters. » The hotel offers 598 rooms, 22 restaurants, 4 swimming pools, 7 tennis courts, a sauna, and a marina. » Local wall sculptures up to 90 meters high are of great interest to tourists. » Dubai Mall is the largest shopping and entertainment center in the world (1.2mn m2). 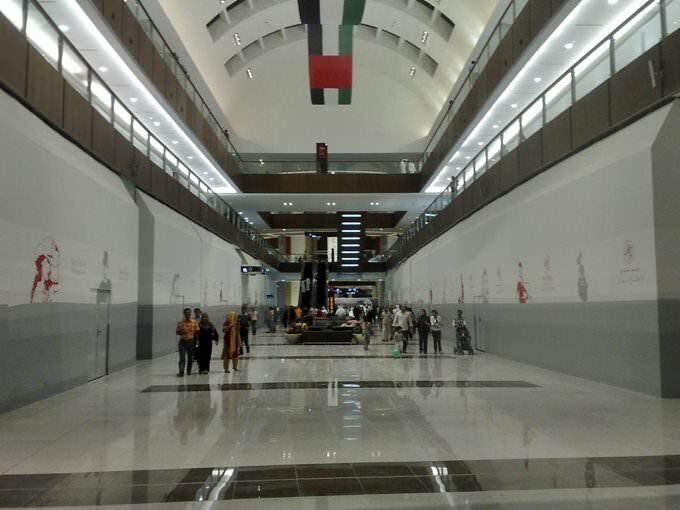 » There are 1,200 stores as well as cultural and entertainment facilities of world-class at Dubai Mall. » This trade and entertainment center has the Olympic-sized ice rink. » Dubai Mall can also boast the world's largest indoor aquarium, where you can see more than 33,000 fish and marine animals. » Dubai Mall is located in the most prestigious place in the world, in downtown of Dubai. » The Emirates Towers is a complex of two skyscrapers. » It includes the 54-story Emirates Office Tower of 354.6 meters height and a 56-storey Jumeirah Emirates Towers that is 309 meters high. » Both skyscrapers are built alongside and connected to each other; moreover, they are like two peas similar to each other. » The complex of skyscrapers features the 25-meter swimming pool without a roof. » The building has two floors of special, for women and men. On the women's floor ladies can look in the glass in beauty salons, do yoga, or look through fashion magazines. Men can enjoy spa center, where they can relax in the oxygen room or soak in hydropool. » Hotel complex Atlantis - The Palm was erected in 2008 on the artificial island of Palma Jumeirah, it also became the first hotel of the island. » It’s a unique engineering structure in the form of two multi-storey buildings connected by an arch. » The hotel has 1539 rooms. The most luxurious suite, located above the arch, has huge windows, from which the island "Palma Jumeirah", Dubai and the Persian Gulf are well visible. » A series of water entertainments is a special feature of the complex: a huge aquapark "Aquavenchur", a Dolphin Bay, an aquarium incorporating 70,000 marine animals. » Some rooms, halls, restaurants, children's club have windows directly to the aquarium with its inhabitants. » 16 restaurants and bars serve the tourists, providing dishes of world cuisine. » At the opening of the hotel, a grandiose fireworks took place, and it was 10 times higher than the salute in Beijing at the opening of the Olympics. 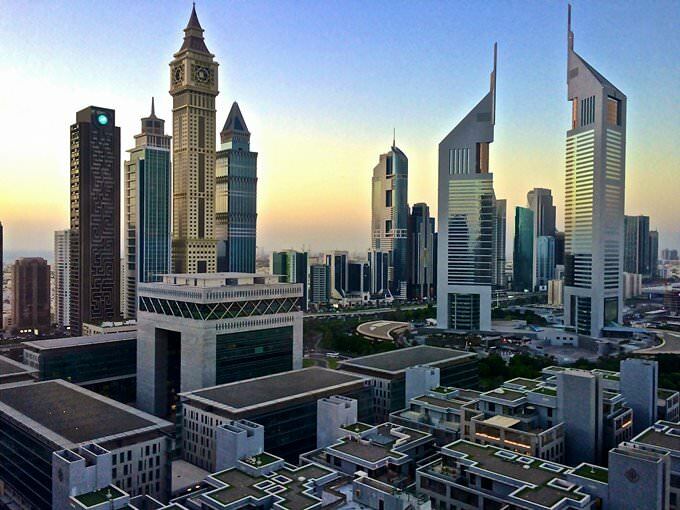 » The Emirates Park Towers hotel complex is a two-story skyscraper demonstrating modern architecture and unusual design. The height of the twin towers is 376 m.
» Marriott International Hotel, the largest business center, conference halls, wellness center, banquet halls, expensive branded boutiques, as well as residential apartments are located on the floors of the complex. » There are 20 restaurants and bars here. 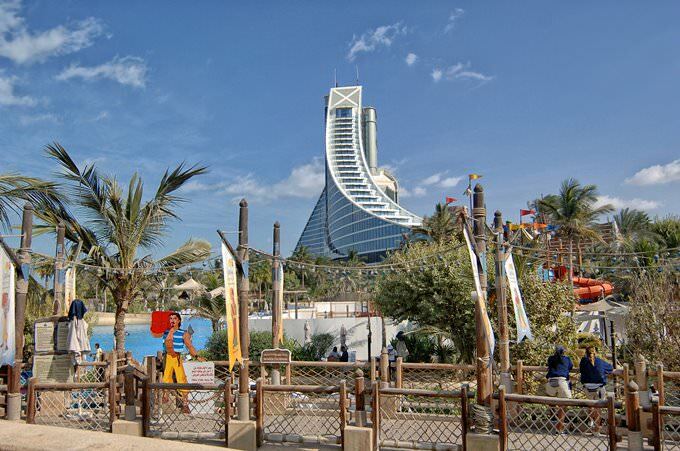 » The hotel provides free admission to the Wild Wadi Waterpark and to the private beach of Jumeirah. » Dubai's Emirates Towers and the International Airport are connected by a monorail. Facts: » The initiative to create the so-called Dubai Silicon Oasis belongs to the government of Dubai. This free economic zone has the opportunity to develop the most advanced scientific technologies. » For this purpose, an area of 7.2 million square meters is allocated. 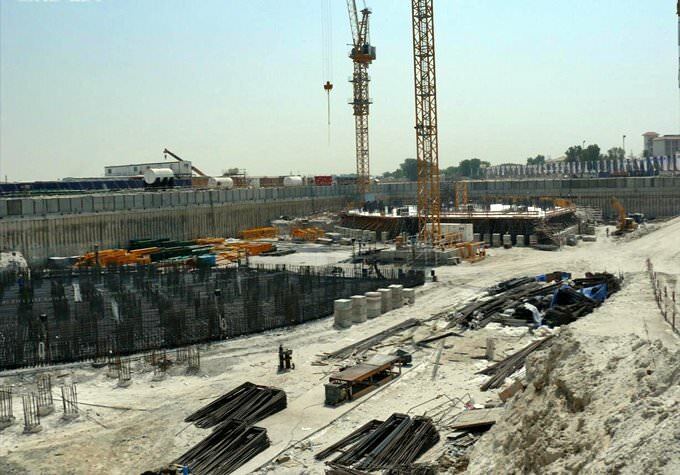 » The plan provides for construction of 560 residential villas and offices, as well as high-rise buildings for housing and commercial purposes. » It is envisaged that the Academy of Electronics and Design will be built here. Besides this, prestigious educational institutions - GEMS International School and AMA University - will be opened here also, all surrounded by sports grounds, waterfalls, parks and shops. » The technology center has a very advantageous location in the city: near the shipping port, within 15 km of the international airport, and within 20 min of the Emirates Road. » Dubai Silicon Oasis is attractive also for the world financial companies by creating excellent conditions for work and business. This guide to architectural sightseeing in Dubai is protected by the copyright law. You can re-publish this content with mandatory attribution: direct and active hyperlink to www.orangesmile.com.